it is a cheap product so I had a low opinion from the start. 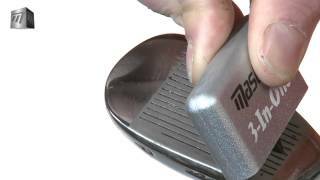 works well on clean enough clubs not the best when the club is very dirty. Does what it says on the tin. If it lasts a year even better value for money. Small & compact cleaning tool that fits in pocket. Does what it says and you cannot argue with the price. There isn't a lot to this product but it does the job. Easily stored in your pocket. Handy tool. Works well, easy to carry. Handy tool. Works well, easy to carry. Great with several cleaning options. Doesnt add weight to the bag. This item, although cheap, is pretty much rubbish. The brushes are maybe somewhat useful but the groove cleaner wore out after just a few times. I would recommend looking for something else to clean your clubs, I know I did. Combining a brass brush, a nylon brush and a club groove cleaner this handy tool is great for keeping your golf club's performance. A dirty club-face and grooves will affect the flight of the ball, which in turn could severely affect your score.